This cheery space is flooded with natural light with windows on three sides. 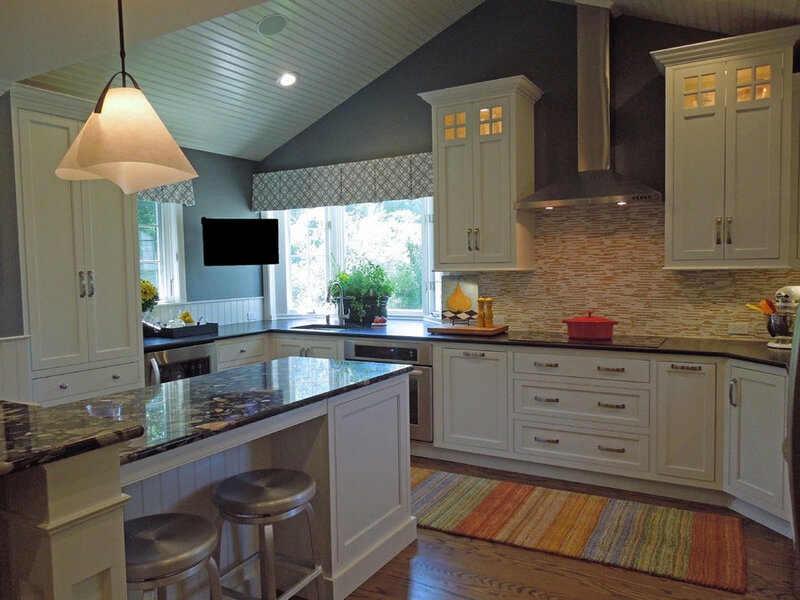 The high bead-board wood angled ceiling is accented by the dramatic tall cabinets with window-pane topped doors. The shiny steel chimney style hood creates a focal point accented by the stunning marble and onyx back-splash installed horizontally on the walls. The smooth cook-top is so sleek it blends seamlessly into the honed granite counter top The multi-level island has seating on three sides at two heights to accommodate 6 diners. Rich hardwood floors anchor the space and the paint is a deep chalky charcoal with blue undertones. Designed by Delicious Kitchens & Interiors, LLC This project was featured on the Palace Theatre's Kitchen Tour and was part of a talented collaborative effort including but not limited to the teams at L. Newman Associates/Paul Mansback Inc., RE Marble and Granite, Capital Kitchens and Delicious Kitchens & Interiors, LLC. The angled ceiling is accented by the dramatic tall cabinets with window-pane topped doors. The shiny steel chimney style hood creates a focal point accented by the stunning marble and onyx back-splash installed horizontally on the walls. The smooth cook-top is so sleek it blends seamlessly into the honed granite counter top. Designed by Delicious Kitchens & Interiors, LLC This project was featured in the Palace Theatre's Kitchen Tour and was part of a talented collaborative effort including but not limited to the teams at L. Newman Associates/Paul Mansback Inc., RE Marble and Granite, Capital Kitchens and Delicious Kitchens & Interiors, LLC. The high ceilings are accented by the dramatic tall cabinets with window-pane topped doors. 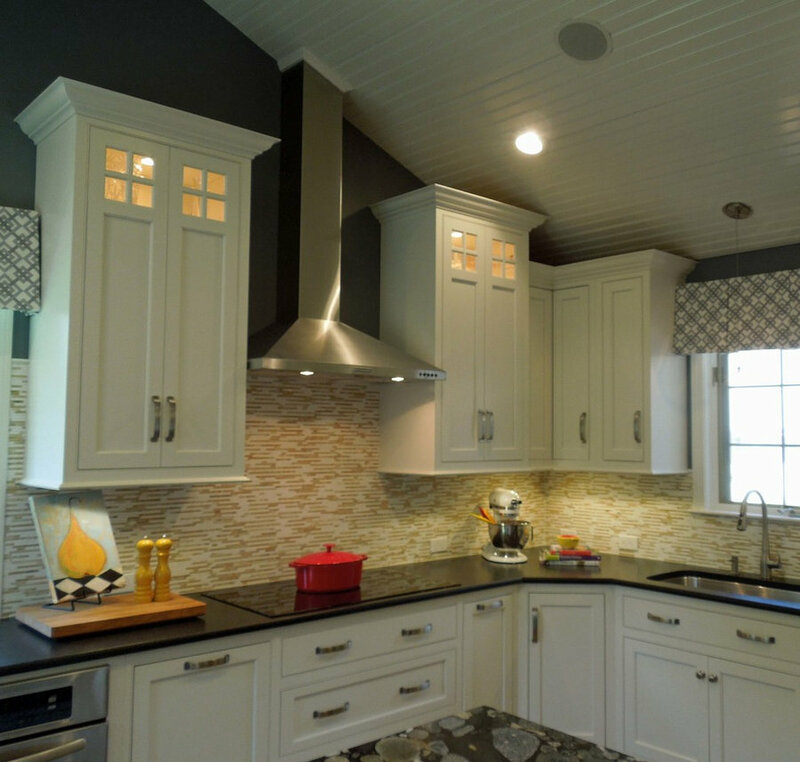 The shiny steel chimney style hood is a focal point over the sleek smooth cook-top. Designed by Delicious Kitchens & Interiors, LLC This project was featured in the Palace Theatre's Kitchen Tour and was part of a talented collaborative effort including but not limited to the teams at L. Newman Associates/Paul Mansback Inc., RE Marble and Granite, Capital Kitchens and Delicious Kitchens & Interiors, LLC. 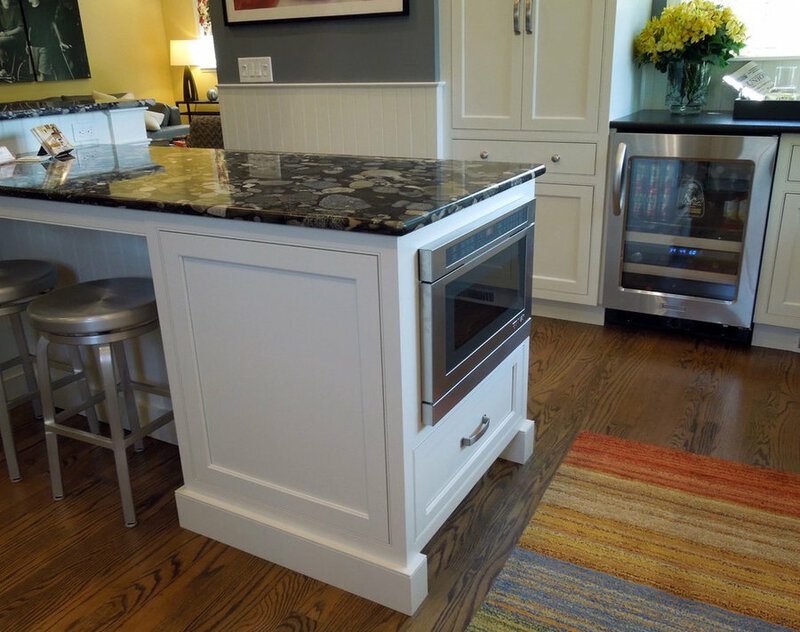 This multi-level island features seating at counter height on both long sides as well as raised bar seating on the back which is open to the great room. The microwave drawer is conveniently located and the beverage center holds both wines and other drinks in close proximity. Designed by Delicious Kitchens & Interiors, LLC This project was featured on The Palace Theatre's Kitchen Tour and was part of a talented collaborative effort including but not limited to the teams at L. Newman Associates/Paul Mansback Inc., RE Marble and Granite, Capital Kitchens and Delicious Kitchens & Interiors, LLC. This open space was created by removing the wall between the kitchen and the great room. The appliances are positioned to allow multiple cooks preparing simultaneously for this busy family. The angled ceiling is accented by the dramatic tall cabinets with window-pane topped doors. The shiny steel chimney style hood creates a focal point accented by the stunning marble and onyx back-splash installed horizontally on the walls. The smooth cook-top is so sleek it blends seamlessly into the honed granite counter top. Designed by Delicious Kitchens & Interiors, LLC This project was featured on the Palace Theatre's Kitchen Tour and was part of a talented collaborative effort including but not limited to the teams at L. Newman Associates/Paul Mansback Inc., RE Marble and Granite, Capital Kitchens and Delicious Kitchens & Interiors, LLC. The bay window provides a view to the driveway and front garden and also allows fresh herbs to grow at your fingertips. The secondary prep sink is large enough for most tasks and is near the bar refrigerator, wall oven and island with it's microwave drawer. 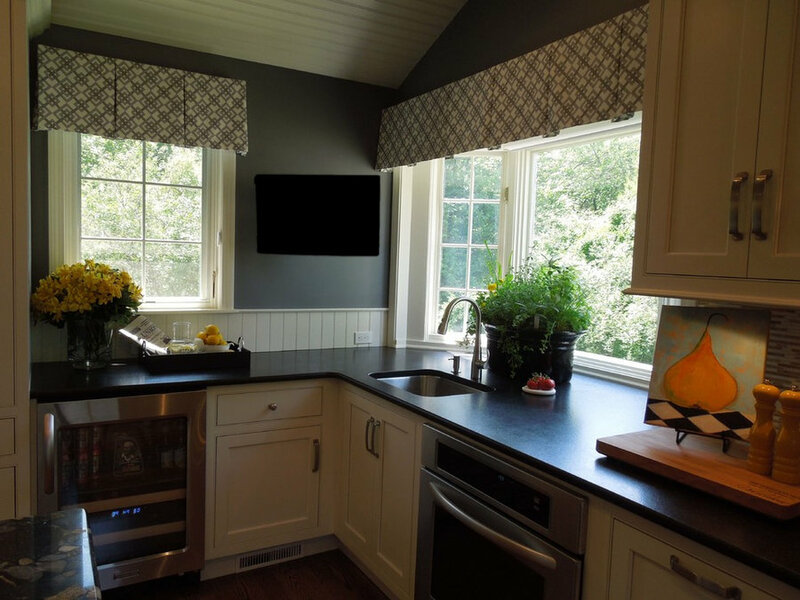 The wall mounted TV is easily viewed from the island seats or by the chef at the cook-top or prep stations so as not to miss her favorite shows or breaking news. 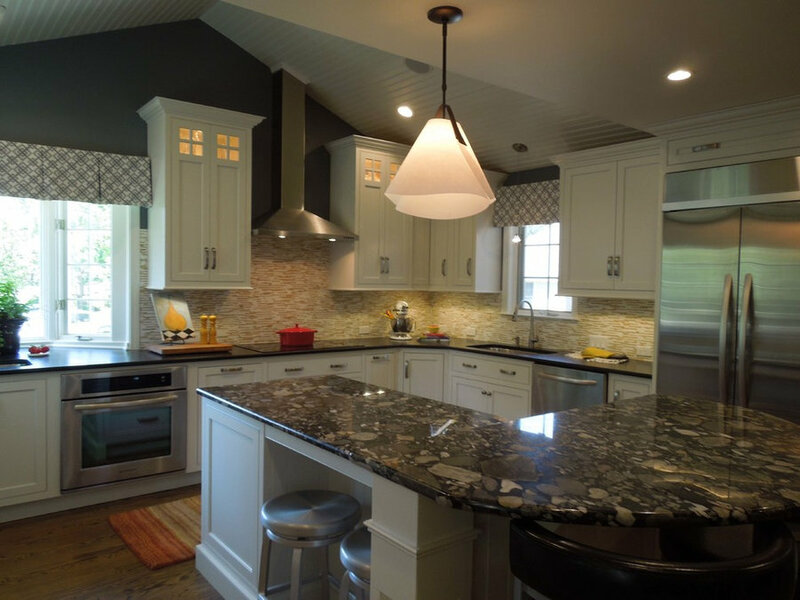 The perimeter black granite counters have an antiqued finish while the island granite counters are polished. Designed by Delicious Kitchens & Interiors, LLC This project was featured on the 2012 Palace Theatre's Kitchen Tour and was part of a talented collaborative effort including but not limited to the teams at L. Newman Associates/Paul Mansback Inc., RE Marble and Granite, Capital Kitchens and Delicious Kitchens & Interiors, LLC.